I've decided that wearing pink makes me happy. My mood and self-esteem is significantly higher when I'm wearing it - the glow on my face in these (and other) outfit pictures attests to this. Oddly enough, I've never really been drawn to pink before. Conclusion? Wear more pink. Buy more pink. This wrap dress is the same style as the dotted one I wore a few weeks ago. I was so happy with the fit that I was thrilled to find they made the dress is this infectiously cheery pink version as well. 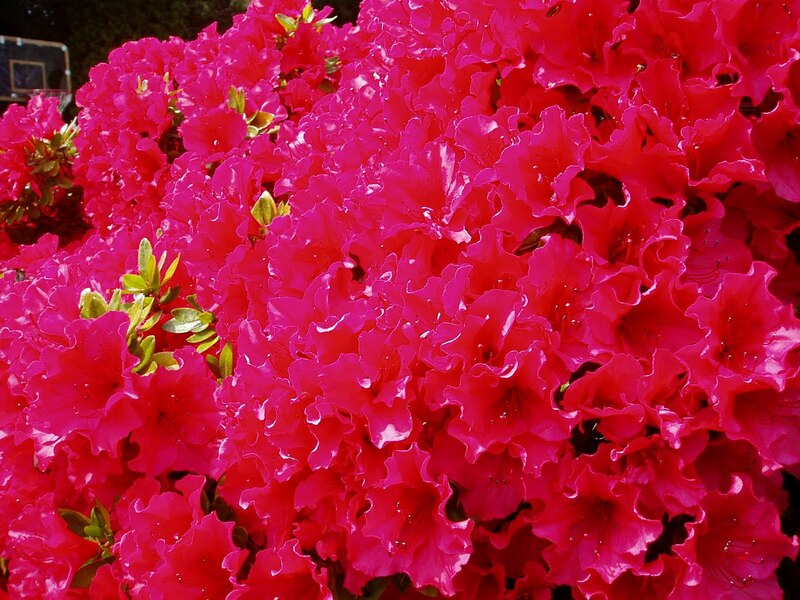 "Summer Azalea" is the name of the color - beyond perfect. Even just the sound of the name evokes a state of summery bliss. I thought I could wear the dress without a camisole, and for evenings out, I perhaps still could. But for daytime, I totes still need one. (I attempted to go the first half of the day without. Uffda.) This is a bummer since the camisole creates unflattering bunching underneath the otherwise clean lines of the dress. A print might conceal this; a light-colored solid cannot. I keep hearing ladies tell me about those mock camisoles (aka "cami secret" or winkee) that attach to your bra; I might have to break down and try them myself! So, I'm hoping this public declaration of my intentions (and reasons) will help me forge ahead. I've already tracked both today AND yesterday, and despite the scary total number of points I've accumulated in only two days, I know that I'm regaining control. So here we go! Stay tuned for the winner of the $50 Kiyonna gift card tomorrow! Power to you, girl! You really are so lovely and poised, but I'll be rallying behind you in your weight loss journey. Feeling physically better and healthier are absolutely the right goals to have. BTW, azalea pink is totally the color I thought to myself before I even saw your flower photo. And it's perfect on your skin. Well selected. Jessica.....you can do this. I have gained a few lbs this year too and it is not a pretty picture on me. You do look great though! That pink is just a wonderful color. Pretty, bright and happy. Looks GREAT on you! I have recommitted myself again too. It's a constant battle, but I am happy with myself- my weight doesn't define me. BUT, it's about being a little healthier. You look great! Thanks for all your inspiration. You're so beautiful, but I agree that health is a concern in your (and my!) mid-thirties. I will always be a curvy girl, but I also want to be fit and have more energy. Your confession is good motivation for me today. I will NOT eat the peppermint patties sitting on the reception desk today! Good luck to you! This is beautiful, sister! And pink certainly does make us glow - I agree that I should own more of it as well. And kudos on WW! You can do it! I should probably start it up again too... I've been thinking about it for awhile now, so I should probably just do it, eh? Good luck, and you look gorgeous!! I think you look beautiful. Even if you've gained, you wear it well. I have been in and out of WW for years. It's a good program. Keep it up. love the blog, and the clothes. thanks kate! i know it's the right mindset, so i'm hoping it takes where i need to go! The dress is lovely and way to go with WW! If you have a cheap tank top you could just cut it off right under the bust; with the tie on your dress under the bust it wouldn't be noticeable then (it would also be less noticeable because you wouldn't have the extra fabric of the seam). I just found your blog and wanted to chime in... I was on Weight Watchers too for a while. I got very very close to my goal weight, and then I got married and didn't return to any of my Weight Watchers eating habits. I know, it's really my fault that I couldn't stick with it, but the idea of counting points again was so tiresome. I now know I just can't keep that up for life. Anyway, a friend of mine recently did Ideal Protein and lost a lot of weight in a very short period of time. I don't know that much about this program, and I haven't heard a lot of people mention it, but reading that you would start WW *again*, made me think I should comment about it. Look it up. It's drastic, and it's expensive, but lots of people have success with it. And I have personally seen a friend of mine get super skinny on it. Anyway, good luck and you have a great blog!